Fabiana Gennari, L’Oréal - UNESCO "For women in science" Award 2016. Photo: CONICET Photography. All around the world, including Argentina, energy consumption is linked to the use of fossil fuel. This implies the dependence on a non-renewable resource harmful for the environment as it produces greenhouse gas emissions, one of the main causes of global warming and climatic change. For this reason, at the UN Climate Change Conference (COP21) held in November 2015 in Paris, 55 countries- Argentina included- agreed on reducing this type of emissions. Pursuing this goal, the team led by 2016 L’Oréal – UNESCO “For Women in Science” Award winner Fabiana Gennari, CONICET principal researcher at the Centro Atómico Bariloche (CAB, CNEA), designed a project for the production and storage of clean energy that does not include, in any of its steps, the emission of pollutant gases to the atmosphere or the waste of valuable resources. The scientist’s challenge was the extraction of hydrogen as clean source to generate energy without resorting to non-renewable or pollutant previous steps. “Currently, hydrogen is used in different industrial processes but there is a problem with the extraction as it is not possible to find it directly in nature: people use fuels of fossil origin to produce hydrogen, making its use unclean”, Gennari affirms. Considering this problem, Gennari’s team -most of them CONICET researchers and fellows- decided firstly to work on the improvement of the production process of hydrogen from energies that are renewable and clean but intermittent –like the Sun and wind; and secondly, to find efficient and safe ways to store it until demand time. 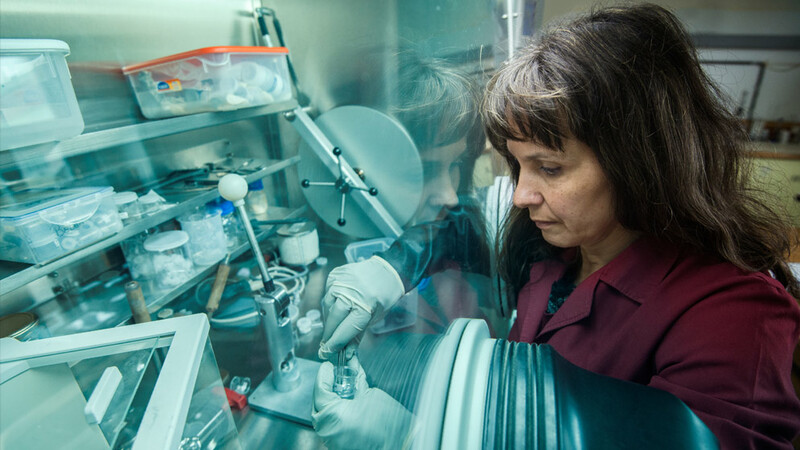 “We developed nanostructured catalysts that allow us to obtain hydrogen from an ethanol mixture –which is obtained from the fermentation of organic waste- and water. However, as this transformation also demands the use of energy, we aim to use momentary clean sources such as solar and wind energy, and take the hydrogen through a nanostructured sponge specially designed to release it constantly when it is available”, the researcher explains. 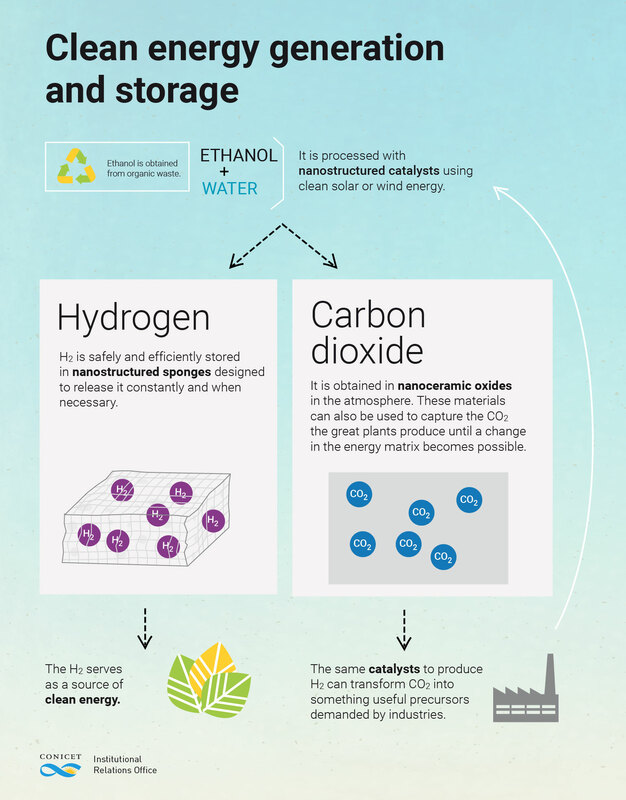 In this process, there is one problem when the catalyst turns the mixture of water and ethanol into hydrogen because it also produces carbon dioxide (CO2), a gas of the greenhouse effect that would contaminate if it was released. “For this reason, we also developed nanometric ceramic materials to capture CO2 in the development site so as to use it to produce value added goods instead of wasting it. The same catalysts we use to produce hydrogen also allow us to transform CO2 into something useful, such as a chemical precursors demanded by industry”, the researcher explains. Taking into account this last step, it is possible to affirm that the project led by Gennari consists of four main parts: 1) The generation of hydrogen, a source of clean and renewable energy from a mixture of ethanol and water through catalysts; 2) Selective capture of hydrogen in solid nanostructured materials to be safely stored; 3) The capture of surplus CO2 from nanoceramics to avoid its release into the atmosphere; 4) CO2 transformation into added value products from the same catalysts used to generate hydrogen. “I’m very happy with this award but I don’t take it as a personal achievement because we are a team of 11 professionals who have worked on this for a long time; and we have always known that for sustainable growth and better quality of life it’s necessary to produce energy free from pollutant gases”, the researcher adds.